The BMC 21” Self Propelled petrol Lawn Mower is a prime example of mowing technology that has evolved and advanced to deliver a powerful and efficient gardening experience every time. This model has many features to appeal to a wide audience, and is built to tackle an array of different gardens and gardening tasks. 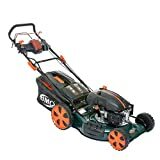 The mower is custom built with a Wolf 6.5hp 4-stroke petrol engine to provide all the power you need to complete many gardening tasks with ease. This model features an intelligently designed system of adjustable cutting heights, ranging from 25 to 75mm, which work in tandem with the very impressive cutting width of 21” to provide an accurate and versatile tool that can cut at many differing levels. A 70 litre collection bag helps to make the gardening experience quick and efficient, meaning you can work for an extended duration without the need for constant trips to the waste bin, saving you time and effort. also collects it, mulches it down into ideal compost material, and then discharges it from the sides, which provides a quick and easy way to transfer mulch to flower beds and allotments when mowing next to them. This model was designed with ease of user access in mind, incorporating all the controls required to operate it onto a central mounted panel for ease of access, as well as being near the comfortable foam padded handles. The mower is easy to steer and highly manoeuvrable, with the responsive and intuitive controls making it perfect for navigating obstacles such as garden ornaments or deck chairs. Overall, the model is well designed, elegantly yet extremely powerful and highly recommended for its superior quality and appealing features. The powerful engine ensures you can accomplish any task, and the adjustable drive speed controller means you can always mow at your own pace, maintaining control and precision throughout. The adjustable cutting heights mean that you’ll always be able to decide the correct level of cut for your lawn, and the larger bag helps to eliminate the need for constant trips to the bin to dispose of waste materials. The new design features such as the lithium ion starting battery allow for constantly simplistic activation, which saves you the often frustrating task of bending down and struggling with a spring loaded recoil. The ESi is a durable and reliable mower that was built to last, and will earn its place among any gardening arsenal.